Easily installed in existing homes or new construction, this complete kit comes with everything you need to install the Spot by Vroom hose management system yourself. No longer do you have to lug out a hose in order to utilize the power from your central vacuum! Wally Flex is here to save the day. The Wally Flex butler system mounts on any wall in your home and is hooked up like a standard central vacuum valve. Mount it in the laundry room to easily clean out lint from your dryer, or mount it in the kitchen to clean up the daily messes. The extendable hose easily stretches from 6' to its maximum length of 18' to clean up any dirt or dust! Get yours today at Central Vacuum Direct! Note: The Wally Flex is installed like any other central vacuum valve. You will need to have the rough-in complete, or have a contractor run a central vacuum pipe line to hook up the Wally Flex. If you have any questions feel free to contact us at our toll free number. Harnesses the power of any central vacuum system with the Spot hose management system by Vacuflo. Easily installed in existing homes or new construction, this time saving device allows you to put the hose where you need it most, where the messes are. Next to the dryer, in the pet's area, in your foyer, wherever you need it. Available in three colors to match any decor; white, black or almond. Spot is easy to use. Simply open the door, pull out the hose and pull the red tag. It's that simple. When you're done just push the hose back in, flip the red switch off and close the door. Vacuflo makes it easy to clean up small messes with Spot. Dimensions: 8"Hx5.75"W. Comes with 15 foot, soft flex hose. Harnesses the power of any central vacuum system with the Spot hose management system by Vacuflo. Easily installed in existing homes or new construction, this time saving device allows you to put the hose where you need it most, where the messes are. Next to the dryer, in the pet's area, in your foyer, or wherever you need it. Available in three colors to match any decor; white, black or almond. Spot is easy to use. Simply open the door, pull out the hose and pull the red tag. It's that simple. When you're done just push the hose back in, flip the red switch off and close the door. Vacuflo makes it easy to clean up small messes with Spot. Dimensions: 8"Hx5.75"W. Comes with 15 foot soft flex hose. Harnesses the power of any central vacuum system with the Spot hose management system by Vacuflo. Easily installed in existing homes or new construction, this time saving device allows you to put the hose where you need it most, where the messes are. Next to the dryer, in the pet's area, in your foyer, or wherever you need it. Available in three colors to match any decor; white, black or almond. Spot is easy to use. Simply open the door, pull out the hose and pull the red tag. It's that simple. When you're done just push the hose back in, flip the red switch off and close the door. Vacuflo makes it easy to clean up small messes with Spot. Dimensions: 8"Hx5.75"W. Comes with 15 ft. soft flex hose. When you need to clean something up in a hurry, Vroom is your answer. 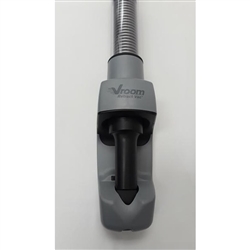 From cat litter to the babies first spill you can pick it all up with the Vroom hose management system. Vacuum lint off your cloths before leaving your home or clean the interior of your car like you're at the car wash with Vrooms optional tools and attachment sets. Vroom is the total cleaning solution. Vroom hose management system with 18 foot of hose, floor/rug tool, and adjustable wand. The ultimate garage kit is here! The Vroom Garage system includes everything you need to install a Vroom system in your garage. You get a powerful FC300 cyclonic vacuum system, brackets and hardware for ceiling mounting, the Vroom hose management system, plus all the tools and accessories you need. mesh bag caddy, and adjustable wand.